I am so thankful to work with caring and creative individuals. The activity below is from our STAR (Speech Therapy: Awareness and Recognition) Family Newsletter by my colleague Lynne Christofaris, MA, CCC-SLP. I love this craft because you can include all of the family in the activity. To help your child with Down syndrome actively participate use picture directions. You don’t have to do this on your own! I have two resources for families wanting to do this project. First, are visual pictures to support the directions Lynne gives below: How to Make a Gingerbread House. Second, I found a great website with more specific instructions and pictures for every step: http://www.wikihow.com/Make-Gingerbread-Houses-Using-Graham-Crackers. “The holidays are filled with plenty of entertaining activities, great food, and beautiful decorations! Take some time with your child to notice and describe all the wonders around this time of year. Creating a gingerbread house with your child can be a great way to encourage his or her language through a meaningful and memorable experience. It can be fun and tasty, while providing many language learning opportunities! 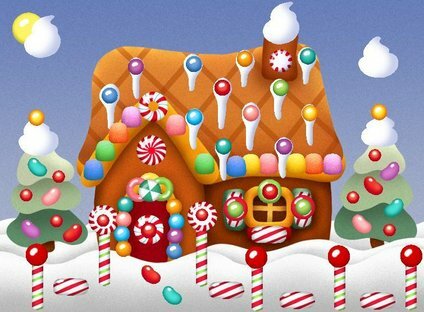 Here are the basics to get your gingerbread house started, but use your creativity to make your house extra special! The more decorations you use, the more things you’ll have to talk about! Royal Icing: Used for decorating and is the “glue” that holds the gingerbread pieces together to form the house. Add the remaining powdered sugar to the sugar-egg mixture. Using an electric mixer, beat on high-speed until the icing holds stiff peaks. If it doesn’t form stiff peaks, add more powdered sugar. Place a dampened clean towel over the bowl of royal icing. Keep this towel over the icing to prevent it from drying out while you work with it. When you are ready to mortar or decorate, fill a Ziploc freezer bag with the icing. Cut off the tip (a small cut) of one of the corners of the bag. Plastic or metal piping tips are available in supermarkets which you can also use for more controlled piping. Describing Words: Talk about how things look, feel, and taste. Ask your child to describe and compare items used to decorate the house. Possible describing words include colors, shapes, flavors, textures, and other attributes. Location Words: Talk about and ask questions related to where items or parts of the house are located. Possible location words include: top/bottom, inside/outside, front/back, next to, between, sides/corners. Action Words: Action words are an important part of vocabulary and sentence building! Emphasize all the things you are doing while making the house. Possible action words include: mixing, breaking, pouring, stirring, cutting, squeezing, holding.